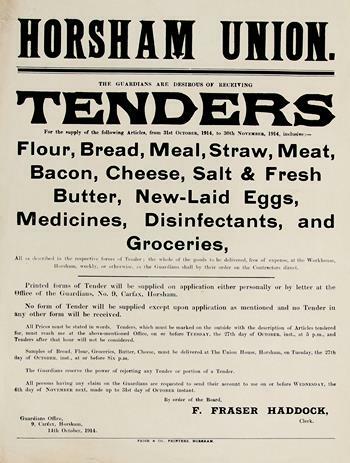 Flour, Bread, Meal, Straw, Meat, Bacon, Cheese, Salt & Fresh Butter, New-Laid eggs, Medicines, Disinfectants, and Groceries. All as described in the respective forms of Tender; the whole of the goods to be delivered, free of expense, at the Workhouse, Horsham, weekly, or otherwise, as the Guardians shall by their order on the Contractors direct. Printed forms of Tender will be supplied on application either personally or by letter at the office of the Guardians, No. 9 Carfax. Horsham. No form of tender will be supplied except upon application as mentioned and no tender in any other form will be received. Tenders must reach me at the above-mentioned office on or before Tuesday 27th October by 5 pm. Samples of bread, flour, groceries, butter, cheese must be delivered at The Union House, Horsham on Tuesday 27th October at or before six pm. The Guardians reserve the power of rejecting any tender or portion of a tender. All persons having any claim on the Guardians are requested to send their account to me on or before Wednesday 4th November next, made up to 31st October inst.